At my house, we celebrate New Year's Eve with food. (Technically, we celebrate most things with food...) We all stay home, sometimes a friend or two join us, and we nosh through the night (favorites include egg rolls, tator tots with cheese, and this year I'm making Frosty the Cheeseball!). There's usually some games, a movie, and sometimes we even stay up and count down to midnight. I suppose it's not the most exciting, but it's how we've always done it, and I love that! 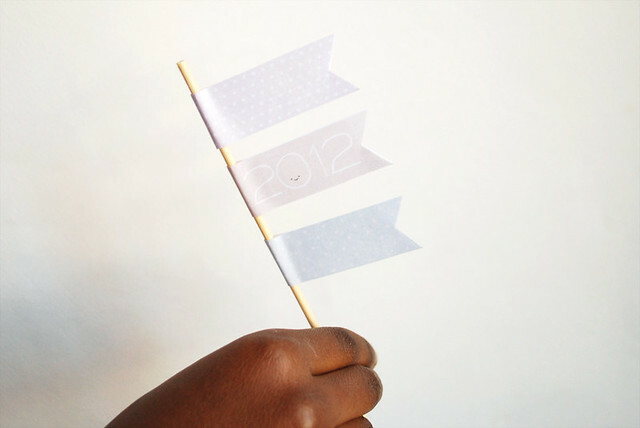 To go along with the goodies, I've made some little printable flags to help ring in the new year. They say things like "Happy Happy!" and "A New Year!" and 2012 (with a little happy face!). Plus there's patterned flags with no writing. They go well with cupcakes, but you could add them to other food too! 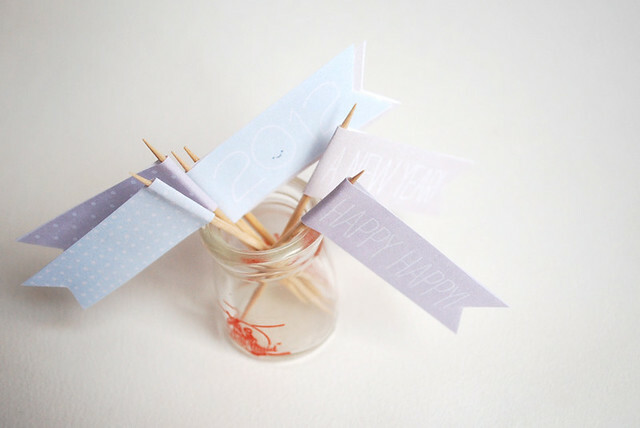 Download the PDF, print and trim, then wrap them onto a toothpick or skewer using glue stick or double-sided tape. How do you like to celebrate New Year's? thank you sweetie! we usually spend our new year's eve by attending a progressive supper followed by games until midnight with our church. so much fun! have a happy new year filled with God's love! blessings to you! Thank you so much for this post. I want to let you know that I posted a link to your blog in CBH Digital Scrapbooking Freebies, under the Page 5 post on Dec. 30, 2011. Thanks again. We are food-and-board-games types too :) I have chips & salsa already but need to get some egg rolls and some sparkling grape juice. And pizza probably. Basically it's our last junk food hurrah before trying to eat healthier until like February, lol.